Oh, the Sky is Falling! Reuters laments 2012 carbon emissions hike! WASHINGTON — Global warming alarmists were disappointed by the 2012 reports on carbon emissions as some continue to question the feasibility of such restrictions. Reuters reports that carbon emissions spiked this past year, and noted that China was the chief culprit. China will not sign a U.N. agreement to limit greenhouse gases like carbon emissions. The U.S. and EU saw a fall in carbon emissions, according to the International Energy Agency (IEA) this past Monday. The emissions rose 1.4% worldwide, said the Paris-based IEA. Reuters tries to soften the criticism by saying that China’s 2012 output was lower than in previous years and is championing renewable energy and energy efficiency. 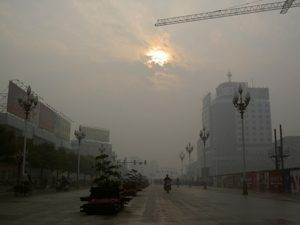 Too bad they missed out on reports that Chinese renewable energy initiatives have crashed and burned within the past year, as Bloomberg reported. One of the reasons for the decrease in emissions? The IEA said it was due to the economic recession and slowdown and some countries’ efforts to promote renewable energy.